Regardless of the approach that is used for continuous improvement, at some point in the process the team will engage in a discussion to identify potential solutions. The most common methods include silent brainstorming or a round-robin format, collecting the ideas from all team members for consideration by the team. Often, this can be very productive. A sufficient number of ideas is obtained and the team reaches consensus on which ones to implement. However, one limitation of these conventional brainstorming techniques is that the ideas are generated within our existing paradigms. In other words, every one thinks about potential solutions in the context of how we currently do things. As a result, the improvements that are made tend to be incremental in nature. But what if we are seeking significantly higher levels of performance? Will the ideas that the team implements be sufficient to get us there? Or what if we have already made several improvements to the process, but the performance level is still not where we need it to be? The team may need to leverage an alternative way of thinking to generate new and different solutions. The Creative Challenge E/R/A approach is designed to question the current solutions. It allows us to investigate the current way that work gets done – and surfaces alternative solutions that could be even better than the existing ones. 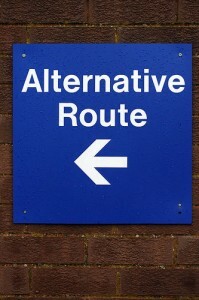 Creative Challenge E/R/A is a systematic approach to identify alternative solutions. After the team lists the process steps and the associated beliefs, assumptions, and limitations, they use 3 questions to challenge the status quo. To facilitate group discussion, a poster or worksheet like the one below is often used, with the columns in the table labeled accordingly. E – Can we eliminate some part of the process without negative consequence? A – What are the alternative ways that we can provide the feature or function? This method can be used to assist teams who are struggling to generate solutions that would allow for a breakthrough in performance. The following case study explains how this tool was used by a team to minimize the amount of waste that was being produced in a unit operation. A series of waste reduction projects, centered on a finishing process, were completed over a number of months. Collectively, these efforts were successful in dramatically reducing waste – from 7.6% to 1.8%. When compared to benchmarking data on similar operations, the improved process was now among the best-in-class in terms of % waste (see chart below). But the process owner believed there was an opportunity to be even better. He chartered a project and charged the team with further reducing the waste. He explained that the remaining losses were worth capturing, as the additional capacity was needed. The team was perplexed, because all the obvious solutions had already been implemented. After all, when you have achieved best-in-class performance, what more can you do? It was clear that they needed to frame the problem differently. The project mentor facilitated the use of the Creative Challenge E/R/A approach to assist the team. The team used a process map to understand what was happening in each step of the process. Although this had been done before, the group constructed a more detailed process map and coupled this with a video of the process. This was critical for the team to understand not only how work was being done currently, but also as an aid for the next step. The process steps were listed on the poster. Any beliefs, limitations, and assumptions were added. Here is where some of the “sacred cows” were identified. (Sacred cows are those things that we either take for granted or are not willing to change simply because “we’ve always done it that way…”). When going through this exercise, it was important that even the most fundamental assumptions were highlighted. For example, the timing and sequence of work was included. Likewise, the speeds at which the operation ran during start-up and shutdown were among the operating parameters that were listed. Here is where the previous work began to pay off. As the team worked down the list of process steps and assumptions, they used the 3 questions of Eliminate? Reason? and Alternative? to challenge the status quo and seek potential solutions that would reduce waste. They were able to identify different operating conditions and specific work procedures that resulted in less waste, while maintaining quality and productivity standards. While some ideas were not feasible, the team was able to implement four small improvements that made a real difference. They were able to reduce waste by an additional 1% (note the last data point in the chart below). This final performance improvement had a value exceeding $200k for the operation! Creative Challenge E/R/A is an innovation tool that can be integrated into your traditional continuous improvement tool box. It can be useful for surfacing potential solutions when you need to stretch your thinking. All you have to do is be willing to slay some sacred cows! The Innovator’s Toolkit. David Silverstein, Philip Samuel, Neil DeCarlo. John Wiley & Sons. 2009.